The Great Central Railway (GCR) Class 9J (LNER J11) was Robinson's first goods locomotive design. Developed from the earlier J10, the J11 incorporated a larger boiler and a small increase in cylinder diameter to 18.5in. The boiler diameter was increased from 4ft 4in to 5ft. 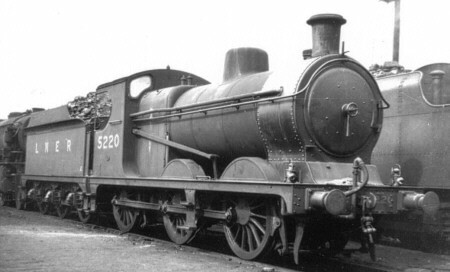 Both the boiler barrel length and firebox were lengthened, resulting in an increase in the wheelbase, and an increase in the firebox grate area. The boiler pressure was also increased from 160psi to 180psi. An initial batch of forty J11s were built by Neilson, Reid & Co in 1901-2. These were quickly followed by eleven further batches built between 1902 and 1910. Most of these were much smaller, although a large batch of forty eight was built at Gorton in 1906-8. 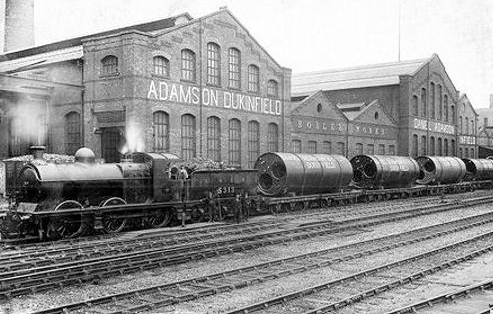 Beyer, Peacock & Co; Vulcan Foundry; and the Yorkshire Engine Co. also built some of the batches. A total of 174 J11s were built. The J11s quickly acquired the nickname of "Pom-Poms" due to the similarity of their exhaust noise to that of the "Pom-Pom" quick-firing gun used in the South African War. All of the J11s were built with slide valves and saturated boilers, with the exception of No. 16. No. 16 was built in 1909 with an 18 element Schmidt superheater and piston valves. This was the first GCR locomotive to be superheated. The Schmidt design secured the elements in the header with bolts and copper jointing rings. Robinson quickly modified the basic Schmidt design, expanding the elements directly into the header. The Robinson superheater became the GCR standard design, and was also adopted by the LNER as a Group Standard design. Robinson superheaters were fitted to the remaining J11s between 1913 and 1946, but the slide valves were retained. This long period of superheating was due to the fact that superheated boilers were only fitted after the saturated boilers were worn out. No. 16 received a Robinson superheater in September 1916. In 1908, J10 No. 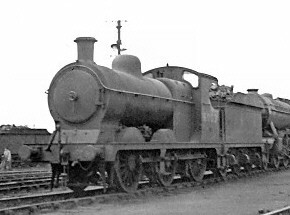 134 was fitted with a 5ft diameter boiler and classified as GCR Class 9M. The LNER classified this engine as a J11, but reclassified it as J10 when a normal smaller boiler was fitted in December 1924. Replacement boilers built between 1918 and 1925 had their boiler pressure reduced to 160psi, to reduce maintenance requirements in the post-war period when the workshops were busy with heavy repairs. The other boiler pressure variation concerned five locomotives built in 1906 that temporarily ran at 200psi. The LNER was quick to attempt to bring some of the J11s within the new Composite Rolling Stock Gauge. A number of different boiler and dome modifications were used to bring the J11 height within the 13ft gauge height. Some reversions also occurred as spare boilers were swapped between engines. These changes were complex, and it was not until 1946 that all of the J11s fitted within the Composite Gauge. The first J11s were fitted with twin-column Ramsbottom safety valves. From 1904-5, four-column Ramsbottom safety valves were adopted as the J11 standard. The LNER fitted Group Standard Ross pop safety valves in the 1930s. Eventually all the J11s would receive Ross valves, with the final conversions occurring in around 1939. Thompson chose a modified J11 to be one of his LNER post-war standard classes. The main modification was the fitting of long-travel piston valves similar to those used on the J39s, but with a smaller diameter. The new valves required the boiler to be pitched higher, and in-turn a shorter chimney to be fitted. Between 1942 and 1953, a total of thirty one J11s were rebuilt with these piston valves. The original standardisation plan also called for round-topped fireboxes, but this part of the plan was not implemented. The J11s were very popular with the enginemen, and at various times they worked just about every class of train from pick-up goods to express passenger! Most of the GCR and Cheshire Lines sheds received significant numbers of J11s at one time or another. Eighteen J11s were loaned to the Railway Operating Division and shipped to France in 1917. All returned between April and July 1919. The only casualty was the tender on No. 1043 which was seriously damaged during a collision, and scrapped. At Grouping (1923), the J11s were allocated: Immingham (32), Gorton (31), Woodford (29), Lincoln (17), Annesley (16), Retford (14), Sheffield (13), Neasden (7), Mexborough (6), Langwith (4), Leicester (4), and Tuxford (1). Shortly after Grouping, the LNER purchased large numbers of war surplus ROD 2-8-0 (LNER O4) locomotives which tended to displace the J11s from their heavier duties. The J11s in-turn displaced older, smaller 0-6-0s which were then withdrawn or moved to other areas of the LNER network. In 1927, twenty six J11s were allocated to the GE Area to replaced J15s which had been withdrawn. These J11s were allocated to Norwich, Lowestoft, Yarmouth, and Cambridge; and performed a considerable number of main line duties. All of the J11s returned to the GC area by January 1933. The LNER took over the Midland & Great Northern Joint Railway (M&GN) in October 1936. Due to shortages of usable motive power, six J11s were allocated to the M&GN during the next twelve months. Most quickly returned, but Nos. 5222 & 5232 remained until 1942 and 1943 respectively. The withdrawal of older ex-GCR 0-6-0s led to a wider distribution of the J11s during the 1940s. At Nationalisation (1948), the J11s were allocated to: Retford (23), Gorton (21), Mexborough (16), Langwith (14), Immingham (12), Staveley (12), Annesley (11), Barnsley (9), Lincoln (9), Sheffield (9), Woodford (9), Frodingham (7), Tuxford (7), Liverpool (5), Neasden (3), Louth (2), Wrexham (2), Colwick (1), Leicester (1), and Walton (1). During the early 1950s, the London-Midland Region took control of the Cheshire Lines, and the Cheshire J11s were moved to the Eastern Region. The J11s were designed for and mainly used for freight traffic. However, they were used for some passenger services and their passenger duties tended to increase over time. Gorton often used them for passenger traffic until diesel railcars were introduced. Although J11 passenger duties tended to be limited to stopping services, they were occasionally used for express services in an emergency. For example, during the 1930s they were used in an emergency to haul the Manchester to Liverpool expresses on a number of occasions. The J11s could operate at a reasonable speed, and the Thompson piston-valve rebuild J11/3 engines were timed at 60mph on a number of occasions. Withdrawals started with the slide valve J11s in 1954. Withdrawal of the piston valve engines started in 1961. Both J11 variants finally became extinct in 1962. The following details are for the standard J11s. No. 16 was superheated and had 20x26in cylinders with 8in piston valves. No. 134 was saturated and had 18x26in cylinders with slide valves. In common with the standard J11s, these two locomotives were fitted with Stephenson valve gear. Cylinders (x2): (inside) 18.5x26in. 18.5x26in. Heating Surface: Total: 1452 sq.ft. 1397 sq.ft. Firebox: 130 sq.ft. 130 sq.ft. Grate Area: 19 sq.ft. 19 sq.ft. None of the J11s survived into preservation. Union Mills sell a ready-to-run N gauge model of the J11. 3SMR produce a 3mm scale white metal kit of the J11. Bachmann sell a RTR model of the J11 for 4mm scale (OO gauge). 4mm scale kits are also available from Bill Bedford and Little Engines. Alan Gibson and BEC have also sold 4mm scale kit in the past, but these are no longer available. Gladiator sell a kit of the J11 for 7mm scale (O gauge). Ace Trains have announced a model of the J11 for O gauge. Thank you to the Mike Morant Collection for the photograph of J11/1 No. 6003. Thank you to Malcolm Peirson for the photographs of GCR No. 228 and LNER No. 5220. Thank you to Geoff Royle for the photograph of LNER No. 5313 with the train of Lancashire boilers.